How's it going with all you lovelies today? Consider yourselves encouraged and inspired to live your life creatively and thoughtfully. It has served me well over the years. For today I'm owning up to a promise that I made. I said I would share this mini book in another post and so without further ado that's exactly what I will do. But first for those of you that missed the sister post let me give you a little back story. Our family, over the course of many years, has had the opportunity to get to know a certain young lady who graduated high school last May and is now on her way to becoming her own woman. As a mother of two young daughters I can not express to you how important it is to us to have this wonderful role model be such a part of their lives. She is very dear to all of us but our two young girls adore her greatly so for her grad gift last year I made her a unique handmade gift...this happens to be just a third of a three part gift (The second and third parts I have already shared in another post). 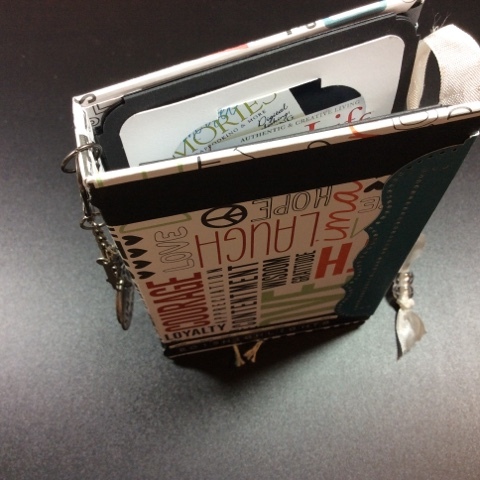 This is the mini book that I created for her. My inspiration...travel...as she was only a month and a half out from heading out of the country on a school trip for two weeks...so that was the theme I ran with for her gift. The beginning of this started with a Tim Holtz mini book kit (shown above) and I'll tell you it is well worth the price of admission. I think the regular price is $20 but I used my 40% off coupon at Michaels and therefore didn't even pay that much. Seriously though Tim has jammed packed this little kit full of all kinds of bits and pieces from his very long line of trinkets and bobbles so in my opinion this is one of the best in mini kits out on the market today. Now having said that I will also admit that I added quite a few extras to my mini book. So when you first open your kit I suggest you get into all the pieces and take a look at the overall scheme because quite literally - anything goes. Tim did have the thought to add in an instruction booklet so that anyone could figure out how to put the book part together so I just followed his instructions but where mine differs is with an extra journal tag that I made myself. I used one of the tags from the kit and traced it onto a creme colored card stock, cut it out about 8 times, then stamped each tag with journal lines using a stamp that I have in my stash. I believe that every other page in my mini book is a journal page. Oh and I made them double sided so that there was a ton of writing space. As I mentioned in the sister post...I have done my fair share of traveling and I am always jotting things down and trying my hardest at the end of each day to make (at the very least) a simple list of all the things we did, all the places we went, some of the food we tried, etc. Those are the things I find the most interesting to me over the years...of course that is not to say that my feelings about certain people, places or things don't get documented too, I just do those in a separate journal or notebook that way I can add in that emotional side of it later and as I see fit. so here's what a few of the pages look like, nothing to crazy. well the third part of the gift it's self was a gift certificate to Persnickety Prints, if you haven't heard of this online photo printing company I suggest you check them out the next time you need photos printed...they are wonderful. Now typically I print at home but I have done a couple of orders through this company and I am happy not only with their pricing but their available options as far as sizing. More specifically for this mini book I needed our dear girl to be able to print in a 2 x 2 or a 3 x 3 or even possibly a 3 x 4 and yep you guessed it, Persnickety Prints can do all of them. One last thing I wanted to mention, not really sure if you can see it from any of my photos but this kit (another way Tim designed it in my opinion) is super interactive if you have the mind set beforehand on how you put the pages together and adhere things down. I made sure that there were lots of photo tucks and lift ups and fold downs, plus a few other things for this to become very much a conversation piece in the future and what another great way for our dear friend to relive the moments of a lifetime. It's the gift that keeps on giving...right? So there you have it...one traveling mini for a dear friend traveling. thanks for stoppin' in and takin' a look, if you have any questions please feel free to comment me and I'll be happy to get back with you as soon as I can. I've included the link to my YouTube video on this mini book below if you're interested in watching that. Hope you have a wonderful day and remember to live creatively and thoughtfully!